TricorBraun has released an interesting item directed at the pharmaceutical market: the EZ-Safe line of closures. The primary benefit of the closures is that they offer exactly what their name would imply: ease of use and security. The patented design of the EZ-Safe Closure delivers a powerful visual footprint for better brand differentiation. Utilizing special ergonomic "ribs" positioned along the outer edge, this closure provides a unique "in-hand" consumer experience. The combined text instructions and pictograms promote proper opening and closing, while the exclusive ribbed edge allows for an easy grip and a more comfortable opening/closing action. Fully-compliant child-resistant features are built in without sacrificing the unique user experience. EZ-Safe is available in a wide spectrum of colors designed to meet virtually all branding requirements. Additionally, the EZ-Safe closure is compatible with a range of bottle sizes, can come complete with an array of liners, and can be ordered in almost any quantity. Sizes range from 28mm to 53mm (visit the TricorBraun website for the most current size options). 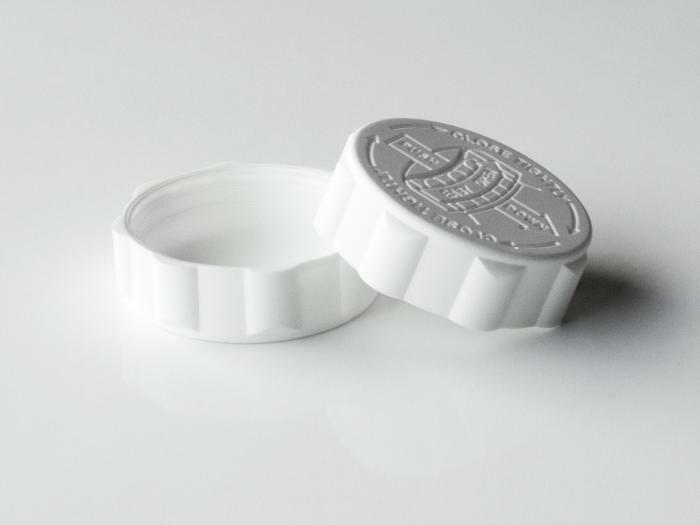 Unlike other CR caps on the market, the opening instructions on the EZ-Safe closure are recessed into the cap, allowing for promotional stickers or coupons to be securely fastened to the top. EZ-Safe closures can be delivered with the same turnaround time as normal caps. TricorBraun, a global packaging leader, announced its 2018 Supplier Partner Awards, recognizing Mold-Rite Plastics as Supplier of the Year, Plastics, and Piramal Glass USA as Supplier of the Year, Glass. TricorBraun, a global packaging leader, has appointed Declan McCarthy as Chief Financial Officer, effective immediately. Reporting to President and CEO Court Carruthers, McCarthy is based at the company’s Global Support Center in St. Louis. A 30-year finance veteran, McCarthy oversees all aspects of the company’s financial functions. He serves on TricorBraun’s Executive Leadership Team, playing a key role in business planning and strategy. Becky Donner, senior vice president of Marketing, Design & Engineering at global packaging leader TricorBraun, will discuss e-commerce opportunities for consumer packaged goods (CPG) brand owners at the inaugural E-Pack Summit in Chicago on September 18. She will demonstrate why an understanding of consumer behaviors can help brand owners better understand the packaging features and functionalities that will lead to sustained brand loyalty. Working closely with TricorBraun, Seventh Generation, has introduced a new green cap for its Natural Dish Liquid, which marks the first liquid dish soap packaging to be made completely of post-consumer recyclable materials. Liberty Property Trust has leased 124,740 square feet of space at its new Class A, LEED® certified building at 3923 Shutterfly Road in Charlotte to TricorBraun, Inc. The 158,760 square foot distribution facility is on schedule to open in late June. It is one of two Liberty buildings in Shopton Ridge to pioneer 36-foot clear heights and 54-by-50-foot column spacing in the Charlotte market. TricorBraun, a global packaging leader, won two 2018 AmeriStar Package Awards from the Institute of Packaging Professionals (IoPP), recognizing innovation and excellence in packaging design. Marking TricorBraun’s 15th and 16th AmeriStar honors, the company won awards for packaging design in the Beverages, Alcoholic and Industrial/Commercial categories. Global packaging leader TricorBraun has been awarded the National Association of Container Distributors (NACD) Best of Show in the 2018 NACD Packaging Awards, marking the 11th time the company has been recognized with the prestigious honor. TricorBraun received a company record of 12 NACD awards, including Best of Show, Best Use of Stock Packaging (bronze medal), six gold, two silver and two bronze medals. The company garnered more awards and more gold medals than any other distributor. Rigid packaging leader redesigns flavored tequila bottle to optimize shelf placement, increasing sales and improving brand recognition. Packaging Options Direct (POD), a division of global packaging solutions leader TricorBraun, has experienced a significant rise in website traffic and increased sales since the addition of 360-degree spin product images to its website. Samantha Juna, TricorBraun industrial design manager, will serve as a juror in the Industrial Designers Society of America (IDSA) Student Merit Awards competition at the University of Illinois today, March 9. Samantha Juna industrial design manager at TricorBraun will serve as juror at IDSA Student Merit Awards competition. Rigid packaging leader TricorBraun today released a new report detailing the top consumer and retail trends consumer packaged goods (CPG) brand owners need to know when developing an e-commerce packaging strategy. TricorBraun conducted qualitative research to understand consumer behavior, preferences, needs and experiences with different scoop designs. Insights gathered directly from consumers about what they prefer and how they interact and use scoops enables TricorBraun’s packaging consultants to understand which scoop solution is preferred for infant formula powders, and identify future design opportunities. For the second consecutive year, TricorBraun Design & Engineering Group's Marketing Communications Manager Charmaine Laine has won three awards from MarCom Awards. An international competition honoring creative excellence in marketing communications, MarCom Awards is one of the industry's largest competitions with more than 6,000 entries submitted. TricorBraun, a leading packaging solutions company, has acquired Canadian-based Taipak, a flexible packaging solutions provider headquartered in Richmond, British Columbia. "The acquisition of Taipak represents a true milestone for TricorBraun: It's the very first time in our more than 100-year history that we have entered the flexible packaging industry," said Keith Strope, Executive Chairman of TricorBraun. "It's a move that significantly increases our product offering and capabilities." Rigid packaging leader TricorBraun today released a new digital magazine addressing the e-commerce challenges and considerations faced by consumer-packaged goods (CPG) brand owners, and how they can increase opportunities for growth with the right packaging strategies and solutions. TricorBraun, a global packaging solutions leader, is pleased to announce that Court Carruthers will become the company's President and CEO effective October 30, 2017. He succeeds the company's long-serving President and CEO, Keith Strope, who will become Executive Chairman. Strope noted the move is part of a long-term succession plan. "To accommodate our aggressive growth strategy, we need to continue building strong leadership into the future. I have enjoyed working with Court as a member of our board and am excited about working closely with him as CEO. I look forward to focusing my time on our longer-term growth efforts as Executive Chairman." TricorBraun Design & Engineering Group today announced that Eileen Krumm has joined the company as an Industrial Designer. She reports to Industrial Design Manager Samantha Juna and is based in Oak Brook, Illinois. In this role, Krumm designs and develops custom rigid packaging solutions for CPG (consumer packaged goods) brand owners located across the globe. With market insights and consumer trends in mind, Krumm works directly with clients to understand their needs and design imaginative concepts specific to required materials and manufacturing processes. TricorBraun Limited, the European subsidiary of TricorBraun, is celebrating the one-year anniversary of formally organizing its office in the United Kingdom, according to Joe Mazzilli, Sales Director - Europe. "We've had a presence in the UK and Europe for more than five years," said Mazzilli. "But establishing roots with the opening of our facility shows commitment to a longer-term strategy. We continue to expand our customer base in Europe and revenue is up." TricorBraun releases new reports outlining research findings and offering best practices for EZ Scoop placement. New research commissioned by rigid packaging leader TricorBraun shows that in addition to eliminating the need for consumers to dig their hands into powder to retrieve the scoop and compromise hygiene, the EZ Scoop improves ergonomic exposure for assembly line workers without affecting operational efficiency. TricorBraun has acquired Continental Packaging Associates, a third-generation, family-owned packaging supplier, according to Keith Strope, President and CEO, of TricorBraun. "CPA is a great strategic fit with a good legacy and reputation," said Strope. "It's family-owned, much like TricorBraun started out". Packaging Options Direct, a division of TricorBraun, has launched a new, online credit application tool, according to Nicholas Jager, Operations Manager at Packaging Options Direct. TricorBraun Design & Engineering Group today announced that Collin Akemann has joined the company as Industrial Designer. He reports to Industrial Design Manager Samantha Juna and is based in Oak Brook, Illinois. To support current and future growth, TricorBraun has announced two key management moves, according to Keith Strope, President and CEO, of TricorBraun. Brett Binkowski, a 20-year veteran of TricorBraun, has been named to the newly created role of Chief Commercial Officer, said Strope. With legalization for medical and recreational use occurring just five years ago in Colorado, cannabis sales exceeded $1 billion in 2016 alone which is a 30% increase. According to the Arcview Group, this industry is estimated to reach nearly $22 billion in total annual sales in the US by 2020. TricorBraun has agreed to acquire Canadian packaging solution company Salbro Bottle to strengthen TricorBraun's Canadian presence. TricorBraun has entered into a definitive agreement to acquire Canadian-based Salbro Bottle, a 27-year-old packaging solutions company. TricorBraun, a leading packaging solutions company, announced it received a record number of medals at the NACD (National Association of Container Distributors) 2017 Packaging Awards. Of the company's 10 medals received at the NACD competition this year, four were gold, four were silver and two were bronze. TricorBraun has undertaken an aggressive new program to hire employees - especially people who might be interested in sales, according to Keith Strope, President and CEO, of TricorBraun. "We see tremendous growth opportunity in the packaging industry," said Strope. "For our organization, organic growth is an important goal and we are making the important investments that will allow us to achieve that growth."